I want to legally change my name to Dragon Fu. Jericho! Their rematch will be the DON main event. And also HHH has a certain taste in wrestlers he likes. Like he was saying Bobby Roode was his favorite in TNA years ago over AJ and Joe. Although obviously that didn't work out that way for Roode. OK, thanks. Hangman reminds me of Seth Rollins. 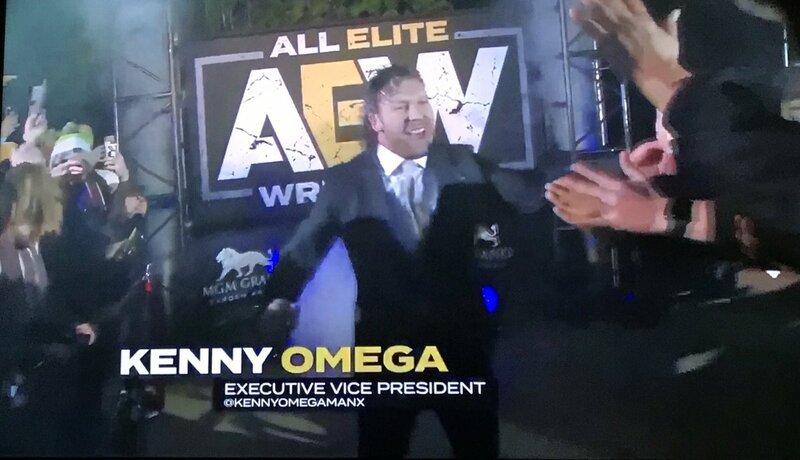 Glad that Kenny chose AEW. Has he said that he'll still be working with New Japan?. The match with Jericho was very good so yea it makes sense it'll be the DON main event. In the update on F4W, it says KO is also EVP of AEW, so they have four EVPs. Does Hangman Page have a position there?, he was a school teacher, so he's arguably one of the most educated of the Elite, so I'd have given him a position in the company too. Any news of Kota coming in?, I know Flip's with ROH til 2020, but read Marty's deal is up in April so in theory he could debut at DON. Omega would wait until NJPW and AEW get a deal together because if they got Kenny now there's no reason to leave their ROH partnership. Page doesn't appear to have any executive gig. I assume the reason is since he's younger and less experienced the Khans didn't think he had anything to offer. Although obviously the Brandi deal was to make Cody happy. Formal education doesn't really matter, Cody got his deal because Dusty taught him so much, the Bucks are genius at marketing and Omega is one of the best at laying out a match today. Nothing on Ibushi yet. He'd probably wait until a deal with New Japan is made because he doesn't want to move to the US so would rather be part time but continue to mainly work for New Japan. Okada also wants to continue to live in Japan. Thanks. Very good point about the formal education, I didn't think of the wrestling standpoint. I do think having 4 EVPs is kinda OTT, but if they are specialising in different areas (say Bucks are doing the marketing, Kennys dealing with the Japanese promotions as isn't he fluent in Japanese?, using his expertise to lay out matches), Cody the booking, hiring talent, wrestling elements etc, then that's fine. I kinda like the possible announce team of Conrad, Alex Marvez and Excalibur. It's different and say they brought in JR or a Joey Styles they'd get that WCW/WWF or ECW association. I would go with Kevin Kelly and Don Callis which is the opposite of what I've said but, I think they are very good on the English language New Japan broadcasts. Any news on a TV deal?. Surprisingly a lack of info on the whole AEW deal. I doubt "Uncle Dave" is keeping it kayfabe but nothing wrong if he was. I much prefer the surprise element or as I've said they are holding their cards close and no ones leaking any info. Yes, Kenny speaks perfect Japanese, as he's been a big fan of their culture since he was a kid reading manga. It's why he wasn't interested in a Wrestlemania main event because he never liked WWF, he was always a Puroresu fan. Cool promo. Yea I thought he was fluent in Japanese. I assume if they do deal with any Puroresu promotion he'll handle the negotiations. Say AWE goes with AJPW, NOAH, DDT etc would that be seen as a disrespect to New Japan or since they aren't partners yet wouldn't they really care?. Kenny did say he wanted to main event a WrestleMania (with AJ) but I assume since he wasn't into the WWF that isn't his number one goal in wrestling. Cool to hear Cody wants to stick it to Vince and follow in his pops footsteps. I think Dream would be super proud of his son for what he's doing with AEW. There are a lot of WCW similarities, but, they can learn from their mistakes. They need to keep Hogan and his buddies, Bischoff and Russo as far away from them as possible. I think creatively they will be fine, BTE is a fun well thought out show and if they expand upon that would be cool. The whole ticket announcement party was much better than the rally. One smark fan shouting comments in the crowd pissed me off though. Kenny looked really happy to be there and I think his pull apart with Jericho was well done and didn't look too cheesy like they do on WWE. It reminded me of what you'd see at a UFC fight or a boxing press conference. So yea big thumbs up for AEW. Great news Kennys on board but I think AEW needs a Villian and a guy who does flips, but I'm sure they'll come in down the line. Plus I'd like to see Kota in AEW, but maybe he'll be on the AEW shows if they tour Japan or Kenny might be able to talk him into coming to AEW. 2019 could be the start of a new wrestling boom period and if it inspires WWE to put on a better product for fans too then it's a plus for all wrestling fans. I wouldn't worry about that. Everyone involved is too smart to fall into those traps. Dixie Carter was dumb and didn't know any better because she didn't understand wrestling. Russo coming in and saying "I did great ratings in he 90s, bro" won't work on Cody, who grew up knowing Russo from Dustin in WWF and his father working for him in WCW and TNA. He also knows Hogan and Bischoff. I think Dusty liked Hogan but was well aware of how he's a snake at business. That's why these guys are involved at an executive level without MBA's or whatever. They aren't going to let the Khans get sweet talked by these types of people only out to con money, because they've been around long enough to know who they are. Dixie had Jeff Jarrett protecting her a little (although he did let his buddy Russo ruin the place) and as soon as he was gone the conmen swooped in and she didn't know any better to get rid of them. True, those are very good points. I bet Bisch has bionic hearing like Cody when he hears a chequebook open Yea they all need to be buffers so the Khan family aren't taking advantage of. Say Eric sweet talked his way in and blew millions of dollars they'd soon sour on their investment. Poor Dixie was taken for a mark but Im sure Tony Khan and his pop are aware of how carny the wrestling biz and won't make the same mistakes. Nyla Rose is the first transgender wrestler signed to a major promotion. (I didn't know who she was so didn't know last night.) And it looks like Sonny Kiss will be a babyface. So they're going to be much more progressive than WWE. News from Dave interviewing Kenny: he has the same deal Jericho does to where he can work for New Japan (non-North American shows only) but says he hasn't had any talks with them since he turned down their offer to stay. But he wants to get AEW going before he goes back. He also said he turned down WWE because they were going to be too controlling. Interesting, thanks. Yea I thought Kenny had that New Japan clause in his contract. I'm sure that AEW will work something out with NJPW down the line. As I've mentioned I'd like to see a co-promoted show where they sell out the Tokyo Dome and the best New Japan talent comes over to work say All In 3, or DON 2 too. For TV deal news, apparently it's a bigger network than Spike they are in talks with. I have a hunch they'll be on TBS or TNT, hence why Cody has been mentioning the WCW comparison. I wonder though, would ESPN be interested in AEW?, since they are likely looking for programming for ESPN+.